Order Holiday gift baskets on line. A Cheese Board curated selection of 4 cheeses. 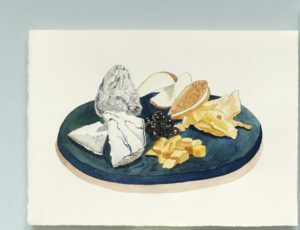 The Assortment includes a soft double or triple cream, a traditional French small format round, an aged nutty mountain cheese and a classic blue. Cheeses will be individually wrapped and labeled with an informational insert and suggested pairings. Accompaniments and cheese cutting tools available for purchase separately.